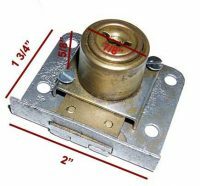 Wanted - one cylinder claw lock (see picture), as found on the upper door of an Exhibit Supply Novelty Merchantman crane. It has two hooks which latch to the door catch. 7/8" diameter cylinder, 2". Outside dimensions: x 1 and 3/4".